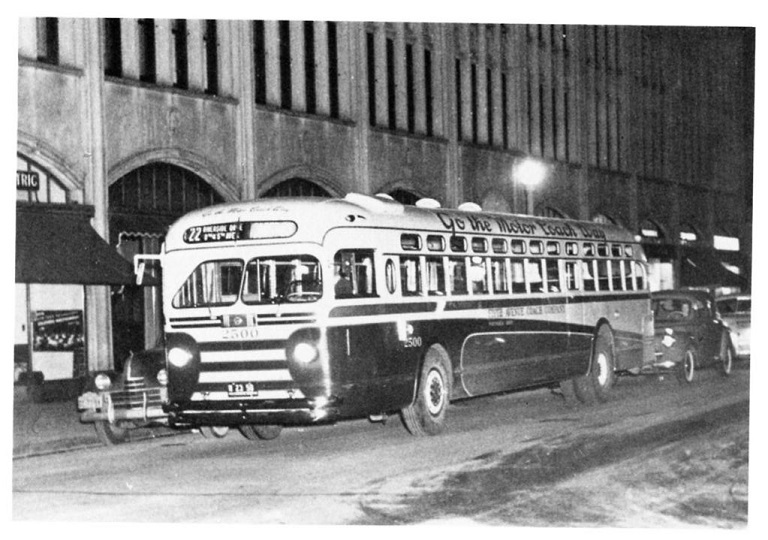 The Fifth Avenue Coach Company unveils a new bus route, No. 22 - Riverside Drive, Eighth and Fifth Avenues, for FACCo passengers traveling to and from Penn Station. Another variant of the basic route coming in and out of Riverside Drive (after the 5 and 19 lines), this new addition, according to The New York Times, "will run from 168th Street and Broadway, via Riverside Drive, Seventy-second Street, Broadway and Columbus Circle to Eighth Avenue and along that thoroughfare to Pennsylvania Station. At Thirtieth Street the route will cross to Fifth Avenue and thence to Washington Square." It is not known exactly how long this route was in existence - part of its route path, especially along Eighth Avenue, duplicated "affiliated" Eighth Avenue Coach's 10 - Eighth Avenue-Central Park West line (which fare is 5 cents as opposed to the FACCo route's 10 cents) - as this did not show up in the 1941 edition of Hagstrom's map of Manhattan bus and trolley routes, and in any case it would have been kaput by the time Office of Defense Transportation (ODT) restrictions on bus operations and travel take effect during 1942-43. Shown below is a picture of the 22 in action, with experimental bus number 2500 (TD-5501) assigned to it.